The Hours - My Memoir: Not One Less! It all began when I watched Children of Heaven; my cousin who shares the common taste in movies like me, suggested that I watch this Persian movie on children. One of her relatives later sent her a pack of four cd’s with all movies on kids, from various Asian countries. Last week, I finished watching all the movies. In the coming posts I would like to review the movies one by one as these are great movies. Not one less (yíge dōu bùnéng shao), is a beautiful 1999 Chinese movie about a small school in a remote village of China. The movie opens with the mayor of the village and a 13 year old girl, wei walking towards the village school where she will substitute teacher Gao for a month as he needs to visit his ill mother. Though Gao is not convinced that wei can handle the school, he has no other choice but to leave after some instructions. Wei is promised 50 Yen for her job but she realizes the school is very poor to afford the price and runs behind the teacher to ask for it to which he says – I will pay you the money if mayor does not, but there should not be one less student than there are now. 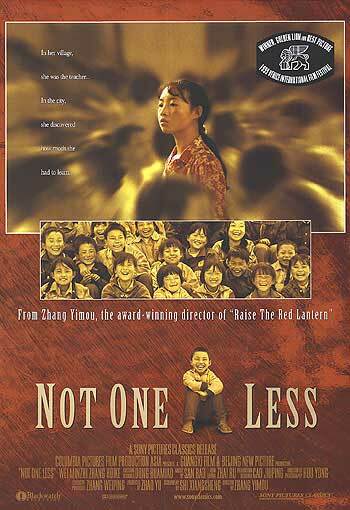 Not one less, is a movie of a small girl Wei, trying to teach a bunch of kids in a remote village and how when one of her students due to poverty moves to city, she with the help of the kids, manages to travel to city and her struggles hard to find the boy. Director Zhang Yimou has used amateur actors whose real life profession is the characters they play in movie and hence the movie seems so natural. The performance from everyone is amazing and makes the movie a treat to watch. The movie silently through its events captures the disconnect between the rural and urban cities of China and the poverty and affect of it on education in rural China. Sounds like a wonderful movie. I hardly watch movies but whenever I catch a movie other than Bollywood or Hollywood the experience is usually rewarding. Thanks for the tip! This will go into my list! P:S- you should've come to the IndiBlogger meet. It was mighty fun. Interesting, will definately check it out one of these weekends. There is still a huge disconnect in China between the rich/poor and urban/suburban areas. As a friend puts it - the social structure in China is a hourglass; only the top and bottom are heavy in presence. Mridula - Yes indeed. I love to watch such movies that give us so much insight about other countries - apart from Uk and USA. Kish -I know, sorry i missed it. Edumund - Yes to some extent this is the case in India too. There is a lot of diconnect between the life styles and attention.